You won't be the only person on human-powered transport as you pedal through Suriname, the Dutch have left the legacy of a cycling culture in this tiny corner of South America. The best part of biking through Suriname is the locals-- it won't be long before someone invites you in to share a meal or chat over a refreshing drink. Suriname's mix of Javanese, East Indian, Chinese and Caribbeans culture makes for a fascinating country to explore. Suriname´s roads vary, with many sections in need of widening and some serious repair work. Traffic near Paramaribo is heavy, but in other parts of the country the roads are quiet. The terrain is gloriously flat throughout most of the country, but you'll have to deal with wind when traveling southeast. The road leaving Paramaribo heading toward French Guiana is in bad condition for about 80 kilometers. The stretch between Moengo and the border is in better condition. Drivers are crazy on this part of the road so take care. There aren't many roads in Suriname, so we got by using the map in our guidebook. Suriname is another country where lodging is expensive. Double rooms in a backpacker guest house in Paramaribo go for around $30. Setting up your tent at a fire station is one possibility, and camping at the local school also works. Locals, particularly those of Indian descent, tend to be very helpful. Prices in supermarkets are similar to Guyana (reasonable), but restaurants are more expensive. By self-catering, camping and arranging stays through Hospitality Club, we kept the daily budget down to $10 per person. A lot of that was spent on treats at the bakery, big bottles of coca-cola and our daily ice cream fix. Safety is not a big issue in Suriname, isn't that a nice change! See the Guyana Country Information section for information on the daily ferry. 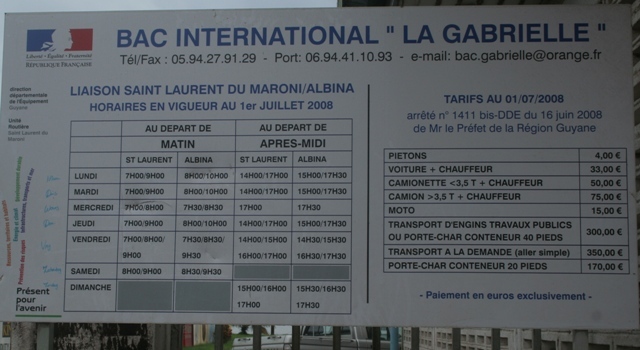 There is regular ferry service between Albina in Suriname and St. Laurent in French Guiana. Note that you must pay for the ferry in Euros. Check out the ferry schedule at right. If you don't want to wait for the ferry, there are plenty of small boats crossing the river. Be sure to get your passport stamped when leaving Suriname and entering French Guiana. Any advice or questions about Biking in Suriname?